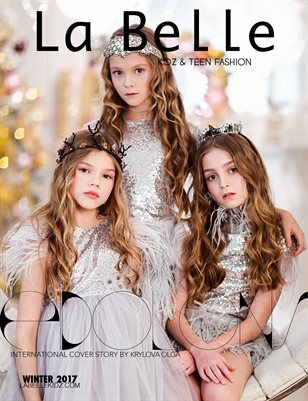 In this issue, we have featured many leading and emerging American and international photographers’ new creations, such as Lily Koz, Krylova Olga and Olesja Mueller… high-end and unique fashion brands such as Janelle Funari New York, Bogatikova with Love, Evelinkids, Stilnyashka, Balloonandbutterfly, Monnalisa… New York Cover Star is Vivian Hicks, and Top Models on Moscow Cover are Alisa Sabirova, Karina Kashirskaya, Anfisa Kaftanova. Faces of La Belle are Gabrielle Sabatini, Natalie Gonzalez and Christianna Cokins. New trendsetters & faces in TOP 20 Fashionistas and La Belle Fav Models, and young talents in Big Dreamers... New York Cover Star - Vivian Hicks's story and interview International cover story at Moscow, Russia Amazing Photographers, Models, Brands, and Talents… from USA, France, Italy, Russia, China, UK, Spain, Poland, Australia, Philippines, Belgium, Canada, Germany, Brazil… 118 pages beautiful and trendsetting experiences!